With a population vulnerable to HIV/AIDS and poverty, Ethiopia needs innovative ways to enable its people to lead healthier, more productive lives. Lack of access to food for HIV-vulnerable populations is especially acute in cities, where land and water are scarce and food options are limited, and where food is expensive due to high transport costs and inefficient agriculture markets. As part of an effort to provide healthier, more empowered lifestyles for people with HIV/AIDS and their families, we were tasked with increasing access to fresh, nutritious food, while giving vulnerable Ethiopians an increasing number of ways to earn a living. The U.S. Agency for International Development-funded Urban Gardens Program for HIV-Affected Women and Children (UGP) followed up on the successes of a previous program, Urban Agriculture Program for HIV-Affected Women (UAPHAW), which DAI led from 2004 to 2008. 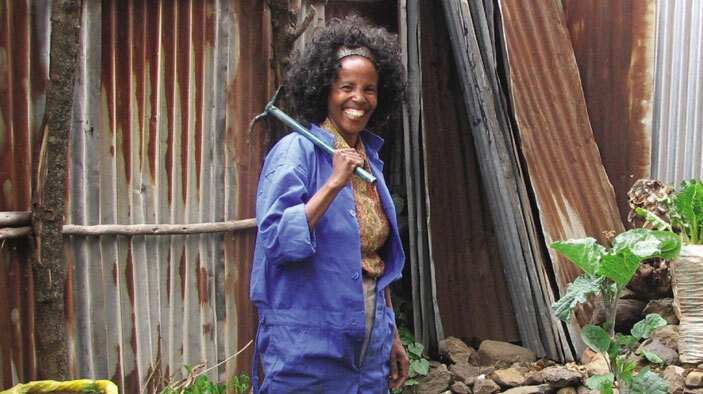 Establish hundreds of communal and school-based vegetable gardens in and around Ethiopia’s cities, tended primarily by women and children, and using low-maintenance water and irrigation systems that minimize laborious water transfer. Creatively engage and empower children and students through microgardening, savings groups, gardening contests, and other methods. Integrate gardening activities with programs to expand access to financial savings, agriculture markets, and poultry to diversify livelihoods and income sources. Use gardens as a community-based platform for transferring skills in gardening, nutrition, group savings, market access, and AIDS treatment and care. More than 400 groups and school-based gardens have given 35,000 households access to training and technologies (such as drip kits) in urban gardening. More than 110,000 women, orphans, and vulnerable children have benefited through access to healthy food, new economic opportunities, stronger support networks, and secure access to land and water. More than 50 local partners continue working with the program to provide technical assistance to the urban gardeners to ensure effective and efficient growing, storing, and marketing of vegetables.